Mother's Ring #1 is a Black Hills Gold band that will accept from 2 to 6 stones to represent different members of your family. Comes with a lifetime guarantee from the leader in Black Hills Gold jewelry, Landstrom's Black Hills Gold. Hand-crafted to last a lifetime. If you have one child, you may wish to include your wife's birthstone or add yours, as well. The stones in Mother's Ring #1 are 2.5 millimeter genuine or synthetic birthstones. 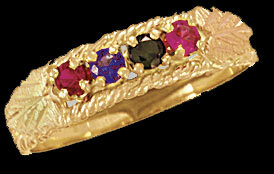 10 karat yellow gold shank and 12 karat rose gold and green gold grape leaves in a classic Black Hills Gold ring. Arrives in an attractive white clamshell gift box. Ships in 10 working days or less. Stone types may not be mixed; please order only with all genuine stones or all synthetic stones. Please call us if you need size 10 or larger. Lifetime Guarantee: If there is a defect in materials or manufacturing, your mother's ring will be fixed or replaced by Landstrom's Original Black Hills Gold Creations free of charge.